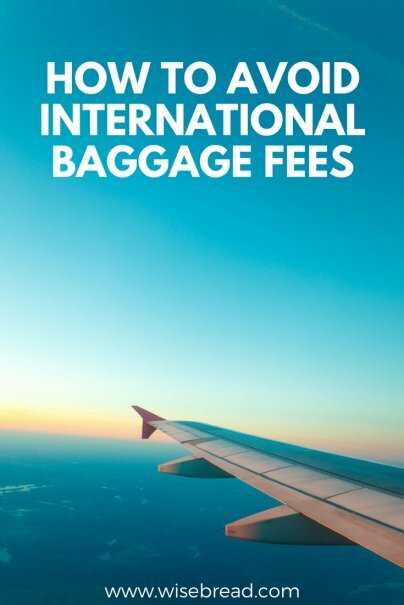 Most airlines will charge you to check luggage when traveling within the United States, but until recently, they at least let you check one bag for free on most international trips. Perhaps it was just a matter of time, but some airlines are now imposing the same dreaded bag fees on international flights as well. Here are the times you'll have to pay a baggage fee for international flights. American charges $25 for your first checked bag on flights to Canada, Mexico, the Caribbean, and Central America (except Panama). It has yet to offer Basic Economy fares to destinations where it currently offers a free checked bag, though it has announced it will begin Basic Economy flights to Europe in April. There is no word yet on how much it will charge for a checked bag when those flights begins. While Delta still offers a free checked bag to most international destinations on most fares, it will charge $25 for the first checked bag on flights to Mexico, Canada, Central America (except El Salvador), Caribbean, Guyana, and Bermuda. However, it recently imposed a $60 bag fee for its Basic Economy fares on flights from the U.S. and Canada to and from Europe or North Africa for flights on or after April 10, 2018. Your first checked bag is still free if you purchase Delta's more expensive Main Cabin fares. United also charges $25 to check your first bag to international destinations in Canada, Mexico, the Caribbean, and Central America. Flights to other international destinations allow your first bag to be checked for free, and United hasn't begun offering Basic Economy fares on those flights yet. Many European carriers have begun offering their own Basic Economy fares on flights within Europe and to the U.S., which they often label "Economy Light." As with the Basic Economy fares offered by the major U.S. airlines, the Economy Light fares on European airlines don't include a free checked bag, but their regular intercontinental flights still do. Examples of major European carriers that have Economy Light fares include Lufthansa, Air France, Swiss, and Austrian. The baggage fees range, and can be quite expensive. Lufthansa charges $60 for a checked bag in Economy Light for a transatlantic flight ($100 if you pay at the airport). Swiss Air charges $150. Even though the airlines are counting on baggage fees to earn them even greater profits, there are several ways you can avoid having to pay for them. Most airline credit cards offer cardholders and their companions a free checked bag, but you'll have to read the fine print. Many cards allow for one free checked bag only within the U.S.
All airlines allow you check child car seats for free. To protect the child car seat, it's best to place it in a large duffel bag. And if you happen to have a few other items packed underneath the seat, it's unlikely that the airline will notice or care. Even when you will be charged for a checked bag, many airlines still allow each passenger to carry on both a suitcase and a "personal item" such as a purse, briefcase, or backpack that can fit underneath the seat in front of you. To carry the most possible, pay close attention to the maximum size allowable and pack efficiently. And if you need to carry a large coat or jacket, try to wear it on the plane rather than pack it. Of course, you are free to stow your jacket in the overhead compartment once you are onboard. As basic economy fares spread, it is becoming even harder to avoid checked baggage fees. It might be worth it to pay more for your airfare just to avoid a basic economy ticket. First, the additional cost of your checked baggage may make the price comparable to a standard fare. But also, basic economy fares don't come with the ability to select assigned seats together, and are not changeable for any price. If the price of a standard fare is close to a basic economy fare plus baggage fees, you may be better off just paying for the standard ticket. Most U.S. airlines and even some European carriers have policies that exempt active duty service members and their families from baggage fees, but some limit it to travel on orders or relocation, while others do not. If you are on active duty or are the dependent of an active duty service member, pay close attention to these policies, and make sure to bring your military ID and any other required documentation. If you fly enough, then you may have earned elite status with an airline that allows you to avoid bag fees. In fact, that elite status will offer you bag fee waivers when traveling on a partner airline within the same airline alliance such as SkyTeam, Oneworld, or the Star Alliance. When using these partner relationships to avoid baggage fees, make sure to bring your frequent flyer card that indicates your elite status, just in case.